We had a jam-packed schedule and I was determined to stick to it. Then we visited the Australian War Memorial and time stood still. It’s almost impossible not to get lost in the museum, not physically of course, but lost within the memories and stories of those who fought for our nation. We started with World War One and moved chronologically, through to World War Two, the Korean War and the Vietnam War. I walked through the battleships, marvelled at the planes in the Aircraft Hall, and was dwarfed by the submarines and boats in ANZAC Hall. All while struggling to comprehend the reality of war. I could’ve stayed there all day. But, we had other places to go. To visit everything in Canberra, you would need much more time than a weekend, which unfortunately is all the time we had. However, we did manage to fit in quite a bit. We hit the National Art Gallery next and strolled through the various exhibitions before heading to the National Portrait Gallery, by far one of the most serene museums I’ve ever explored. Everyone has a story, and the Portrait Gallery attempts to tell these in just one artwork. The next day was all about government and law. We headed over to Parliament House after a delicious breakfast in the heart of the CBD. The last time I’d visited Parliament House was about 15 years ago and in between I’d finished a law degree, so I was like a child visiting a theme park when we walked into Parliament House. I wanted to see the House of Representatives and the Senate, hear a debate, and go up to the roof. I wandered down the hallway, taking in the portraits of Prime Ministers past. We went into The Great Hall, where again, my footsteps echoed. And then we went to the top. After rushing around the building for about 45 minutes, it was nice to sit on the grass and take in the view, down the bridge and back to the War Memorial. No visit to Canberra is complete without a drive around the embassies. We steered slowly down the streets, guessing which Embassy was which way before we read the signs or saw the flags. The architecture is sometimes a massive give-away. The United States Embassy looms over every other, taking over an entire block of the neighbourhood. It’s definitely hard to miss, especially with several AFP cars outside. Being such a law nerd, one of the highlights of my trip was a visit to the High Court. We sat in Court Room Two and were given a history lesson, conjuring up images of the Judges in their full dress, sitting behind the large bench as they preside over exceptionally important cases. The building is every bit as big as you think it’s going to be. Despite being quite old, and probably in desperate need of an update, it’s difficult to ignore the grandeur. Not into history? Meander through the Old Bus Depot Markets where the stalls are full and varied. There’s artwork, jewellery, clothing, homewares and even food. Housed in a beautiful old industrial building, there’s an abundance of colour and delectable smells to greet you when you walk through the doors. Walk along the river and take in the sites. You don’t have to go into the buildings to enjoy the architecture. And if you get Canberra on a good day, where the sun is warm and the wind is slow, it’s a spectacular site. 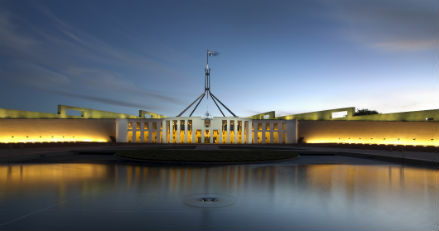 Want to explore the sights of Canberra and delve into Australia's history? Join Probus for the 2013 Rendezvous and sign up for the Pre-Rendezvous Tour with Trade Travel.